I was now lying on my back, my upper body propped up slightly by the seat in my layout blind with my Remington 870 resting by my side. The ammunition boxes were neatly stowed by my right thigh along with my camera and digital recorder. The sky was filled with a bright reddish pink color and the sun was now slowly rising. There had been a slight snow fall mixed with isolated showers between two and four in the morning and the temperature was now one degree Celsius but the sky was beginning to clear with very little clouds. This wasn’t necessarily a good thing; since we had now lost some of our cover. After all concealment was a key factor toward our success that we could not leave out. We had just spent the last hour setting up hundreds of decoys in the shape of a large tear drop along with our digital callers. And it was now time for a rest and wait for the guide’s queue. I must admit, I was so filled with anticipation the night before that I only slept for an hour or so therefore I took advantage of these precious few minutes to get some shuteye. So I laid back and shut my layout blind flaps and stared directly into the sky through the mesh, took a few deep breaths then shut my eyes. Once in a while I would open them and a have a look at the vast sky. I would spot a few Canada Geese flying in at about two hundred feet and then land in the field to the south. At first it was a gaggle of six or so birds, then twenty but within a few minutes as the sun got warmer the numbers increased to the hundreds. The goose calls intensified as the morning went on and soon the sound broke the early silence, and with this so did their numbers almost to the point where I could no longer hear the coyote calls from the field to the east. Goose calls could drive a man mad if they were to be exposed to the sound over several days. I slowly turned my head to the left and stared at the farm-house over a kilometer away to the North West. I could see a very faint dark cloud, it was drawn out over the silo and then over the forest on the northern edge of the farm field. It did not take long, and then eventually the entire horizon was teeming with these dark clouds some in the distinct “V” shape, others made up of a series of overlapping “V” shapes. I was wordless and electrified, we now had thousands of birds flying some three hundred feet above us and some were starting to circle and call back to our decoys and callers. I took a quick glance to the north-east and noticed this winged vortex; it spanned from the top of the tree line to several hundred feet in the air, I was dazed. It was as large as a cumulonimbus cloud. As the birds would turn into the sun this black cloud would become instant white and the effect was extremely hypnotic. It was the famed snow goose. Some of the bird’s right above us were now circling over head like vultures and dropping altitude tucking in their wings just like ducks. I would compare their aerial dance to someone who was stepping into a hot bath pointing the ball of their feet into the boiling water as if they were testing the temperature. Once convinced, a few more birds would drop and circle yet again now just a few hundred feet above us. I could feel my heart wanting to burst, I felt so focused, and it was like living a dream, it seemed so unreal. Then a smaller gaggle of seven birds turned aggressively and dropped down some more now their wings were turned inward and very tight to the bodies floating directly into our shooting arcs. As soon as they were in range the guide called out and our flaps opened with lightning speed the first volley of shells rang out and our first two white wing black tips dropped in the field. If you are willing to see, the great migration has a lot to teach us. The early morning air that surrounded me in the woods was crisp and cold. It was almost like time was standing still and every sound in the forest was amplified. The trees had a pure white coat on them after a light January snow fall at dawn. The temperature was thirty below and the twenty gauge wire that I was working with for my snares was burning my hands as they slowly went numb. I had been tightening the wire around a broken support branch that I had placed overtop my hare lead at its narrowest section. After carefully placing twigs creating a funnel cone toward the opening of my snare, it was now time for me to tie up my trail marker tape identifying the second snare spot. I was only on my second setup and my goal was to have five more completed by mid morning. At about eleven o’clock all my snares were in place and had been inspected. A friend and veteran snare hunter had taught me that after the holidays around mid January it was a good idea to adjust your snare openings. Making them slightly larger than the size of your fist and instead of having the wire around five-finger widths from the ground, he suggested it be around three. Satisfied with my snares, I packed away my gear and prepared myself for the drive home; the anxiety for the next morning’s potential harvest was slowly consuming me. As an avid hunter my excitement level was about the same as someone would experience while waiting to open their gifts on Christmas day. It was now time for nature to take the lead no pun intended. For those who are familiar with nature, especially North American animals there is a belief that badgers have an interesting relationship with coyotes. This relationship gets even more interesting when they are hunting for food together. Let us imagine they were pursuing a ground dwelling rodent, the badger would attempt to dig him out. The coyote on the other hand would simply wait at one of the escape holes and grab the rodent as it escapes. Now it is also a known fact that coyotes are smarter than foxes. The question is then: Is it just smarts or is it simply theft? Another interesting fact about this relationship is why the badger doesn’t just kill the coyote that is stealing or trespassing during the combined hunt. Opportunistic or instinct, is it theft or just survival? The following morning had come and the temperature on the thermostat was showing twenty-four below zero. My goal was to get to the site before nine in the morning, check all my snares and then plan to be home in time for lunch. So I loaded up my gear and headed out to the woods, which was about an hour drive north. My first snare was intact and although there were fresh tracks in the new snow, they did not lead to my opening, so I slowly removed the wire and marker and placed it in my pocket and prepared myself to move to the second snare. I had put on my yellowish tint shooting glasses, which offer such a visual advantage during the winter when sifting through pine and cedar. I also brought along my .22 bolt-action Savage in the event that a hare may break into a full chase, so with this in mind I decided to stalk between my snare spots. 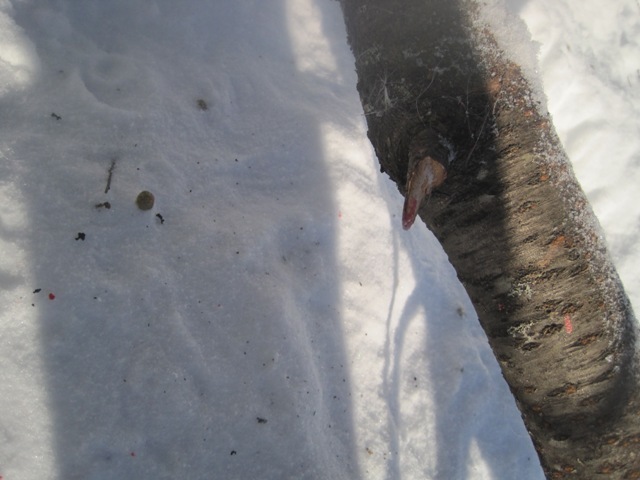 When I got up to my second snare, I instantly noticed the scattered blood droplets on the white snow and branches. There were obvious signs of a struggle, I also saw several droppings scattered on the fresh snow and there were tuffs of fur stuck on the branches and the log nearby. My shiny twenty gauge wire had been torn and was still tied off to the main log. I tirelessly looked for a blood trail around the leads but the hare had just vanished and although there were three other leads heading up the ridge there was no sign of blood. I did however notice prints in the snow heading north-west that looked like coyote tracks; they were headed directly into heavy cedar underbrush and into an area that was quite dark even in daylight. I spent the next forty-five minutes searching the area around the second snare site but did not see any sign of my hare. I gathered up my remaining snares and prepared myself for a challenging season. The tell-tale signs indicate that I had successfully snared my first hare this year but ended up getting badgered by the local coyote. This most definitely adds a more positive spin to my snowshoe hare and small game season this winter because I now have an added challenge ahead of me. I do not wish to be badgered again.